Gaballo (R) and Nakamura during Friday's weighin. All things went well during Friday's weigh-in of all fighters for tonight’s event at the Midas Hotel and Casino in Manila. For the main event, Reymart Gaballo tipped in the scales at 118.5 lbs while Japanese foe Yuya Nakamura came in slightly heavier at 119 lbs. 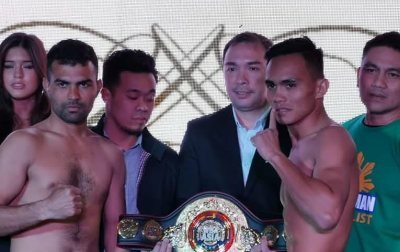 In the co-main event for the coveted WBA Asia Lightweight Title, Romero Duno weighed 134 lbs while Indian opponent came at 135 lbs. Romero Duno (R) and Khuldeep Dhanda. In the co-featured bout, Dave Apolinario tipped at 111.5 lbs. whole Ramshane Sarguilla came at 112.5 lbs. The above featured bouts will be televised live via ESPN5 Saturday at 7:30 PM. First bout starts at 5pm and its free admission.